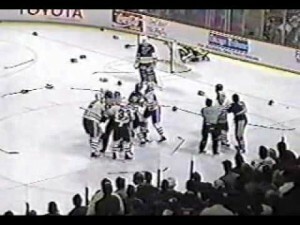 You don’t have to be Irish or drink green beer to remember the St. Patrick’s Day Massacre, which took place on March 17th, 1991 where the St. Louis Blues took on the Chicago Blackhawks (literally). It was more than just a game – it was a defining moment in the National Hockey League and in the intense rivalry of the two teams. This year marks the 25th anniversary of this epic brawl, so it only seems natural to make a moment and reflect upon it. Not a lot of fans remember the actual outcome of the game (Blackhawks won 6-4), however, they do remember the brawl that took place on the ice, resulting in a total of 278 penalty minutes, which included 24 minor, 12 major and 17 misconduct penalties. Twelve players were ejected (six from each team), and multiple players were suspended and fined for their part in the fight. The rivalry between the two teams is common knowledge to hockey fans, but just how deep and intense the rivalry goes (as seen in the St. Patrick’s Day Massacre) is not always known. For starters, the two cities are only 300 miles apart (thanks to I-55), making the actual cities – not to mention every sporting team within – a huge rivalry. Cubs vs. Cardinals ring a bell to you sport’s fans? The Blackhawks and Blues have been in the same division since 1970, meaning a ton of regular season meetings, although some seasons feel more intense than others. The St. Patrick’s Day Massacre will always link the two teams for many fans and solidify the rivalry for every fan, player and coach involved. “This game is known in Chicago and St. Louis as the “St. Patrick’s Day Massacre.” This was a classic Norris Division battle amongst two teams fighting for the President’s Trophy. It was expected to be an intense game, but it quickly turned into a very chippy affair early. A line brawl, started when Featherstone took exception to Jeremy Roenick’s hard hit on Snepsts,” according to Riverfront Times. And it only got worse from there. Anytime there is a bench clearing of both teams, and a single game gets its own name in memory of it, you know it was a pretty big deal. 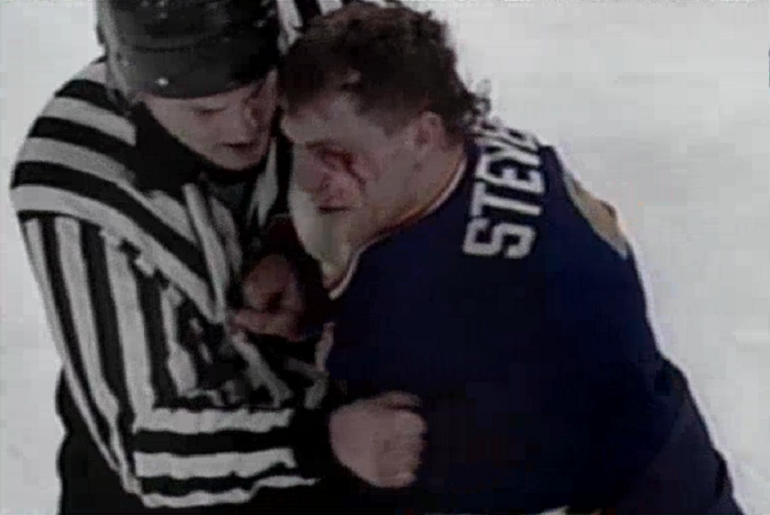 Here’s to 25 years later and all the new memories (and rivalries) being created in the NHL. In case you want to relive those glory days and see the brawl for yourself, check out this You Tube clip from Hockey Fights to see all the action.